Looking to find out more about a medical ancestor? The College Library and Archive has a wide variety of resources for tracing physicians, surgeons and dentists from Glasgow, the West of Scotland and beyond. The most commonly used resources are the Medical Register (published annually from 1858), the Medical Directory (published annually from 1853 - Entries are fuller than the Medical Register, and may include details of the practitioner's publications and career), and the Post Office Directories of Glasgow from 1848-1924. Obituary notices can be sought in the Glasgow Medical Journal (from 1828), the Edinburgh Medical Journal (from 1805), the Lancet (from 1823) and the British Medical Journal (from 1853). All these volumes are available to consult in the College Library. TIf your ancestor was a member of our College we may hold more information on them in our archives. Our Register of Single Licentiates (from 1785), Double and Triple Qualification Registers (from 1859), and Minute books (dating from 1602) may be particularly useful. We are happy to carry searches out for you or you are welcome to make an appointment to visit our library and archive. 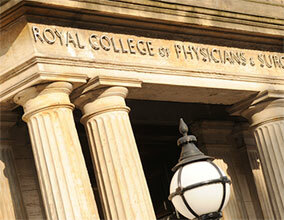 The Royal College of Physicians and Surgeons of Glasgow is unique in being the only UK medical college for both physicians and surgeons while also containing a Dental Faculty, Faculty of Travel Medicine and Faculty of Podiatric Medicine. Our historical collections which have been built up since the College’s foundation in 1599 reflect this diversity and encompass a wide range of holdings from botanical works to surgical instruments. Our archive contains deposited collections from medical greats including Joseph Lister, William Macewen, Ronald Ross and David Livingstone alongside minutes and papers of West of Scotland and Glasgow medical societies and hospitals. Please make an appointment to consult our collections. The College occupies three 19th century houses with beautifully decorated interiors and retaining many original features, first built in 1820 with later additions (1890s) by Glasgow architect, JJ Burnet. Highlights from our collections are on displays, including rare books, medical instruments, portraits and contemporary art. We are happy to provide tours for groups or individuals. Please get in touch to arrange your visit. Our exhibition spaces are open to the public on Monday afternoons 2-5pm without appointment. We're happy to supply images of items from our collection for use in private study, lectures or commercial publications. Low resolution versions of our images for private study or non-commercial use are free of charge - See our terms and conditions and copyright policy for further information. If you would like a high resolution image or wish to seek permission to publish, please get in touch. We charge a fee for commercial reproduction of our images. Visit our Object Donations page for information on donating items to the College's heritage collections.